In what is becoming one of the cruelest and most annoying trends of 2016, another person has filmed themselves taunting a caged animal. We’ve recently seen several captive big cats filmed lunging at what they see as prey, and this seems to have spawned the viral trend. 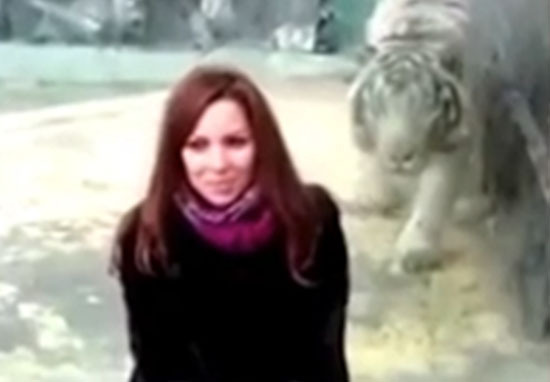 In the latest video a woman can be seen baiting a Siberian tiger into pouncing at her from within its zoo enclosure. But of course she does so from behind the safety of a thick glass wall, so she is absolutely fine but the big cat is left frustrated. The footage is reported by The Independent to have been captured at a zoo in Russia, although it has not been named. You can see the woman actively checking to see if her ‘prey’ act is working, and shock horror it is. With Harambe being shot and orcas actively beaching themselves, you’d think people would stop unnecessarily goading caged animals. But you’d be wrong. It seems being c*nts is just as instinctive to some humans as it is for predators to continuously take the bait.